Last week we talked about our fun at Design Week and learning about how both the psychology and sociology of how a space will be used are taken into account when designing a pocket patio. This got us thinking of how true this is for every project we take on as we don't just look at what is there and what could be there. We take into account what the client will do there, what they want to do there, and everything else. Nowhere is this more apparent than when we are asked to create a design for a project involving kids. 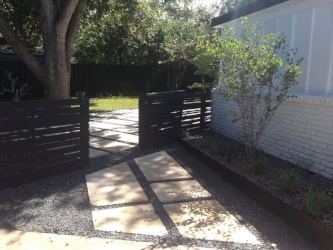 Modern landscaping can be viewed as rigid with it's heavy use of metal and rock, and even somewhat purposeless with the xeriscaping, but child-safe spaces and elements can be included in your design. Rather than rocking your entire front yard, we suggest considering keeping a small area of grass bordered with a low fence to give the children an area devoted to their play. By utilizing a low fence, you create an inviting area that offers the children safety and keeps them from hazards, such as a busy street. While reintroducing grass into the design is a break from normal when it comes to xeriscaping, note that a large area of grass is not necessary. Though the space could be small, the rewards are numerous when you give your children their own dedicated safe space at home. Tree spaces are another important consideration when you have children. Not only do the trees offer a space for lounging, playing, and much needed shade, they offer a place to explore, to create, and can become their own living space. Family memories can be made at all ages around a tree......tree houses, swings, games of tag and hide and go seek.......the list is only as long as your imagination can make it. Raised garden beds are another example of combining modern landscaping with children. By raising the gardening beds, you are not only making an area easier to work with, but giving children a place to learn, explore, and play. By allowing them the opportunity to grow and maintain a garden with you, you are teaching them life lessons and giving them memories to cherish as they grow. Use native plants in your design. By using the native plants, you offer your child a learning opportunity, and a way to instantly bond with nature. As they grow and learn about what's natural to this area, their explorations out of their home will be more exciting as they learn to identify those plants. They'll be able to tell others about it and have a natural and long lasting bond with nature. Include 'wild spaces' where boulders and other elements can be added that would allow your children places to run, jump, climb, and have fun for years to come. So as you consider your next project, don't forget to take into account your child's needs now, as well as what those needs will be over the next decade. Contemplate a raised garden bed that not only is useful and educational, as well as a place to spend some of your child's energy daily, but can serve as a cave, a fort, or even a castle. Thinking of adding some life to that walkway of yours......imagine how much fun the kids will have with the design we help you create. Or, look at how that outdoor patio can serve as an outdoor playroom complete with drawers, hidden storage, and a sink for easy clean-up, or the years of S'more fun you can have with an addition of a custom fire pit. Your backyard paradise should be as much for them as it is for you. For more ideas on things to incorporate, we suggest looking here.